This Energy Generation Hybrid Kit Solar Wind Two 1.0 is ideal for locations with a steady wind flow. In winter when there is less sun the system generates power with the wind generator. These integrated sets allow an easy operation of 12 VDC consumers, such as light, radio, or 12 VDC pond pumps etc. If you connect a 230 VAC inverter, you can also supply any electrical device just as if you were on the grid! 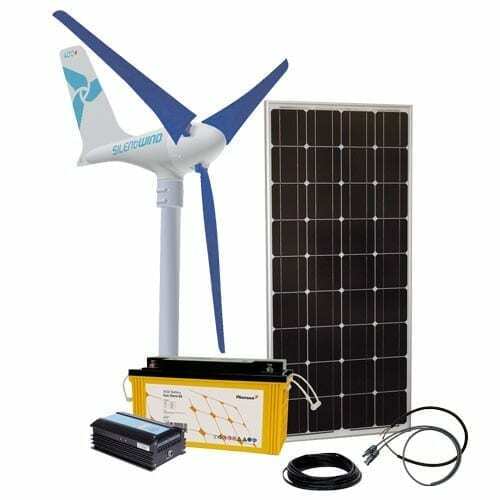 This set is an ideal solution if you need solar power only in the evening hours or weekends, e.g. in your garden or holiday home. The kit does not include the pole for the wind mill!